Copycat Big Mac Sliders are an easy appetizer recipe filled with beef, cheese, and McDonald’s Big Mac sauce! 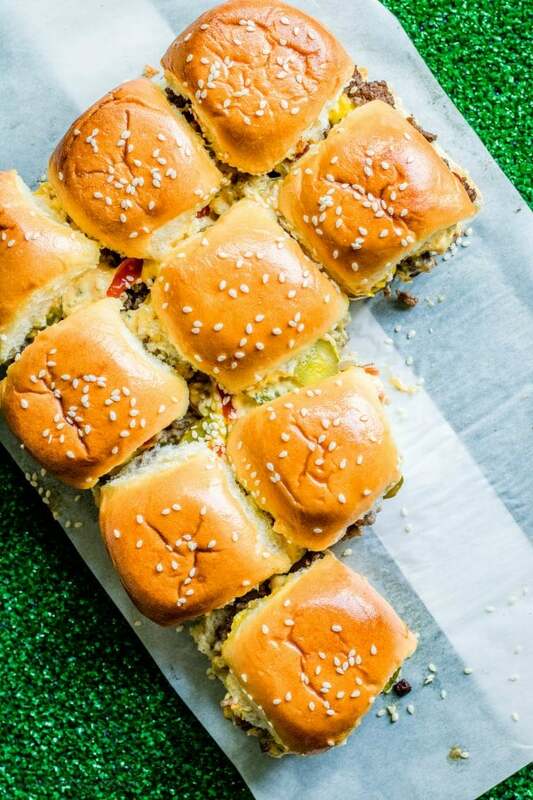 These little Copycat Big Mac Sliders are a miniature version of the the classic Big Mac and they’re going to be making an appearance at my Super Bowl party this year. They are full ground beef, onions, pickles, cheese all packed into soft slider buns topped with sesame seeds. Oh, and don’t forget the secret sauce! That’s what makes a Big Mac so amazing right? 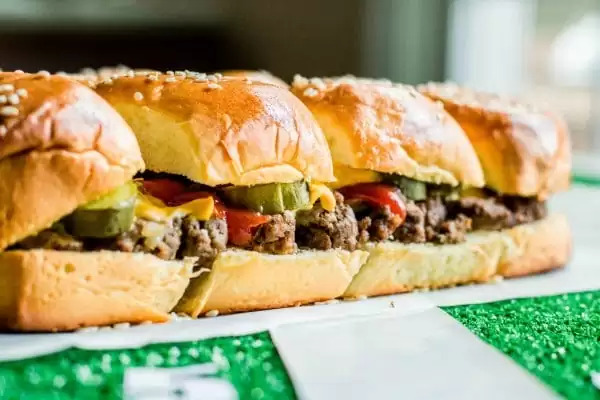 The thing about sliders is they need to be super easy to make so you can feed a house full of hungry people at a party without spending all night in the kitchen missing out on all of the fun. To make these Copycat Big Mac Sliders I skipped making individual burger patties and instead I cooked the ground beef in a skillet along with onions and then (after draining the grease) I spread the ground beef over my bottom slider buns. Then I topped them with American cheese (it melts the best! ), pickle slices, ketchup, mustard, and finally the secret sauce. Then on goes the top bun, brush them with a little melted butter and sprinkle with sesame seeds. Bake for 20 minutes, or until the cheese is fully melted, and you’re ready to party! Let’s go back to that secret sauce for a minute. Seriously guys, the McDonald’s secret sauce recipe totally takes these Big Mac Sliders to the next level. We perfected our recipe when we made our Cheeseburger Tots and it’s just like the original. You’ll have a little extra leftover after you drizzle it over your sliders, just put it in a bowl and let people add extra to their sliders if they want. I promise you there won’t be any left at the end of the party :). 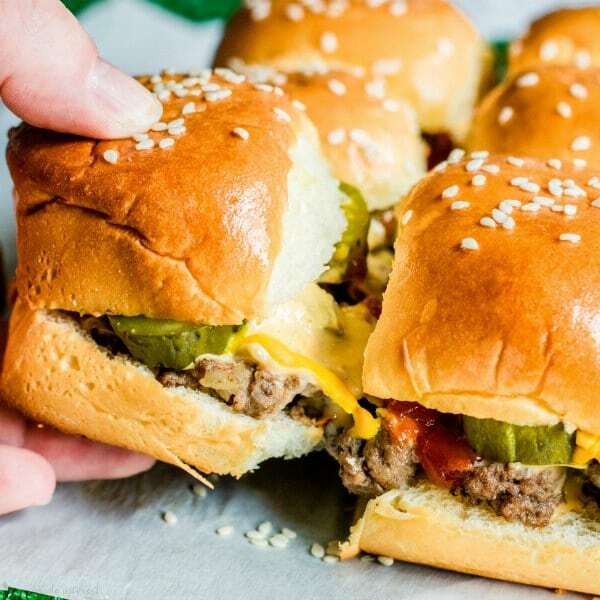 Save time making Big Mac Sliders on game day by cooking your meat and making the secret sauce the day before. Just heat your meat up in the microwave before putting it on your slider buns and you’re good to go. If you don’t like American cheese you can substitute shredded cheddar cheese instead. Line your pan or a casserole dish with parchment paper. That will help you lift the sliders off/out when you are ready to serve. Copycat Big Mac Sliders are an easy appetizer recipe filled with beef, cheese, and McDonald's Big Mac sauce! In a large skillet over medium high heat add diced onions and cook for 3 minutes. 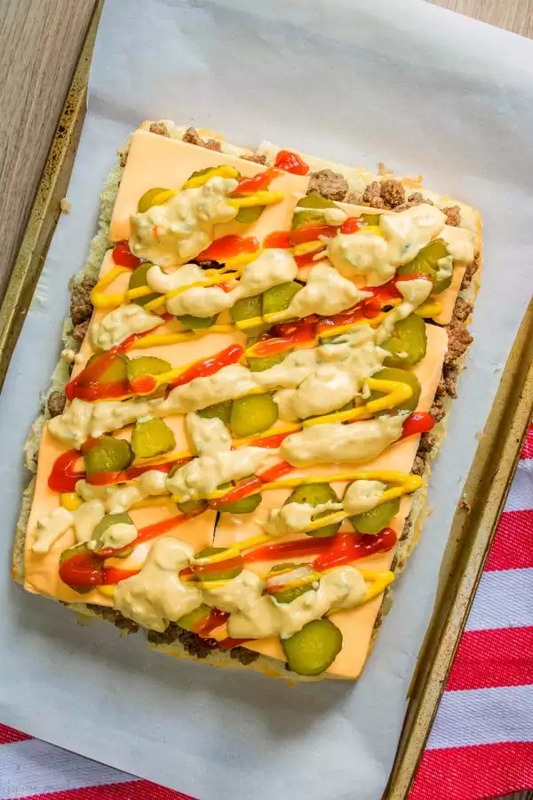 Using 7 slices of cheese create a layer of American cheese over the beef. Place the pickle slices over the cheese. Drizzle with ketchup, mustard, and secret sauce. Combine all ingredients in a bowl and stir together until thoroughly mixed. These look fantastic. I’m planning to try to make these both as written for my carnivore husband and trying them with tvp for my vegetarian family. That looks really good, except that McDonald’s Big Mac is 2 all beef patties, special sauce, lettuce, cheese, pickles, onions on a sesame seed bun. The song does not say anything about adding extra Ketchup and mustard. I think i would eliminate those. Hi Janet, we like the extra flavor the ketchup and mustard add. I’m sure eliminating them would be fine also. That’s what I would do as well. I’ve done the beef patties for sliders that way before and it worked well. Would that be sweet pickle relish or dill pickle relish? 2 all beef patties, special sauce, lettuce, cheese, pickles, onions on a sesame seed bun! No ketchup or mustard, and certainly not crumbled hamburger. Hi Lilli, The crumbled burger is to make it quick and easy to make a batch of sliders. You can certainly cook individual patties if you prefer it just requires more effort which isn’t what most people are looking for in a game day recipe. We added ketchup and mustard because that’s what we like. It’s simple to skip if you don’t want it on yours. Omg, do you not realize she isn’t going to be perfect with the real thing. No one is! If you don’t like the recipe, make it yours by adding what you want. Besides, that is NOT all beef in McDonald’s burgers darling. At least here, you know it is. I will definitely be trying this. Thanks for the recipe !! Good burgers but they aren’t Big Macs with ketchup and mustard. That’s the whole point of the special sauce and what separates Big Macs from other burgers in general. Wow! I guess you need to change your recipe name to “Kinda Sorta Copycat Big Mac Sliders” or “Close But Not EXXXZACTLY Copycat Big Mac Sliders” to placate the Literal Police! Geez, people! I haven’t made these fabulous looking burgers yet, that happens this weekend over Super Bowl!! However, what I love more then I can say and have never seen before now is a site that allows you to change your serving size and the recipe automatically adjusts…YOU ROCK SWEETIE!! Keep up these fantastic recipes and your thoughtful way of posting them! PS.. Following you now on Instagram and getting emails!! Also, will blab you up to my friends list on FB too♥️???? You are the sweetest!! Thank you so much for the thoughtful comment. It totally made my day. Make sure you let me know how the sliders turn out. I could not get enough of them!! I made these for our Super Bowl party and they were tasty! I was wondering if anyone tried to reheat leftovers and they best way to do it? I think if you do low heat and cover them they should reheat with no issues. I made these tonight for dinner and they were a HUGE hit! I added a little extra mayo and a little ketchup to the “secret sauce” as my family likes it like that. I was able to make a small pan with mustard and a small pan without to suit the tastes of my family. Thank you for this recipe, we are definitely adding them to the dinner rotation! So glad you guys enjoyed them!! I just made these tonight and they were a HUGE hit!!!! The sauce is sooo good!!! We will be making these again!!! Made these for a small gathering of friends, wish I had of made more, they were gone in a flash. Super delicious!! Same thing happened when I first made them. Now I always make a double or triple batch. Happy they were a hit! I was reading thru the comments of everyone critiquing the recipe but haven’t yet made it. I made these exactly how the recipe went and like the picture. When i tell u that these sliders were so bomb and such a big hit. If it wasn’t so late at night i would have ran to the store for meat n bread to make them again. GREAT GREAT JOB ON THIS RECIPE. Thanks so much for taking the time to let us know how they turned out for you. This is one of my FAVORITE slider recipes and I’m so glad you liked them too! Thank you so much for this great recipe! I do a lot of entertaining so I’m always looking for something different and tasty to fix. These were a hit for sure. Super tasty. So, for the people that are trying to compare it EXACTLY to a Big Mac I have one thing to say. Go to McDonalds! There is one in just about every town. Seriously, you know by looking at the recipe it’s not exactly like a Big Mac! I just don’t understand why people feel like they have to be so negative and argumentative about food! It’s really not that big of a deal. It’s food people, get creative and be a little more open minded, Pleeeze! And don’t say that I misspelled please. Lol. If you are a person that just wants to add a tasty appitizer to your list, this one is a keeper. Just don’t overthink it. Ok… I’m done ???? Made these today and they passed the test for my Super Bowl party. I made mini burgers, baked at 400* for 8-10 minutes on rack over foil lined jelly roll pan. Used a tsp of pickle juice instead of vinegar. Added lettuce and diced onions. Tried with and without the ketchup & mustard. Didn’t need it because that special sauce is delicious on it’s own. That sauce will double as the sauce for my shrimp po’boy sliders also. Tasted great on them. These will definitely be a hit. So glad you liked them and I love the idea of using the sauce on a po’boy!! I thought these were fantastic and my family devoured them! Thank you! I made these for our monthly game night and they were a hit!! The special sauce was what put them over the top! 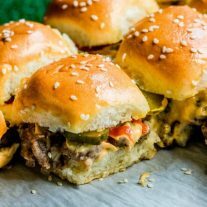 I’ve never made sliders before and I’m sure I’ll make these again! I did have some shredded lettuce on the side for people to add at the end, it worked perfectly. Thank you! So glad you liked them, that Big Mac sauce is everything!! In line #7 it says to put the meat and onion mixture over the cheese. Do you put the cheese on the buns before the meat and onion mixture? Hi Teri step 8 is to add the cheese on top of the meat. If you’d like to put it on before the meat that works too. I found your recipe on pinterest a while back, and my family begged me to make them almost every week. I hadn’t made them in a while, making different healthier meal choices. Out of nowhere my son asks me to make them. I came back to the page to check the recipe and I never understood why the recipe called for 2 x the slices of cheese, I now get that I should have a layer of cheese on the bottom bun. Very excited to have them again. This are amazing!!! The only thing we changed is having sweet pickles instead of the dill. We are actually going to have these two night in a row. Thank you for such a great recipe.